We went through his Instagram profile to get more insight into what he does and the designs are just off the charts! Here is his Instagram for you to check! Despite deciding to not get more tattoos we now want plenty! Pradeep Junior has been a practicing tattooing since 2008, and you can see his experience in his art. Some of them range from traditional, neo traditional, biomechanical, water color, tribal, japanese, dotwork, illustrative to new school and realistic tattoo styles. He has travelled across India and US practicing the art of tattooing and is an ace at the biomechanical style and realism style tattoos. He also received INDIA ACHIEVERS AWARD in 2016 & 2019 for being the Best Tattoo Artist in Bangalore. Pradeep believes hygiene, type of ink used and artist’s technical knowledge is very important in this process, so you paranoid folks, you don’t need to worry. You can also tell your mothers this, as they are probably more worried about your tattoo than you! Consider every artist by looking through their portfolio, reading recommendations and maybe even talking to them in person. 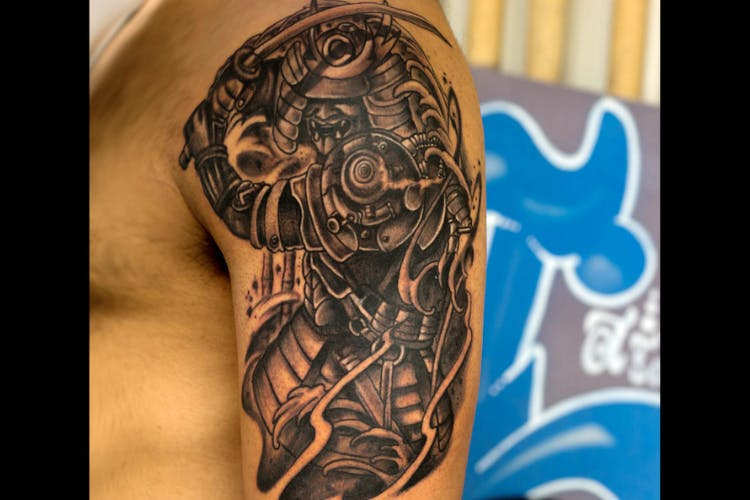 Go check out Pradeep Junior’s work, a skillful visual creator and artist who fell in love with tattooing because of Miami Ink!